A member of the genus Sphenodon is are commonly called a Tuatara. At first glance they look like a pretty cool lizard but studies of them have reveals that they are the last living members of an class called Rhynchocephalia. This order used to be much larger than they are now. Before the three ages of the dinosaurs these guys were hugely diverse, were living all over the earth and there was even a group of them which moved into the oceans. They were nearly wiped out by a mass extinction at the end of the Permian era which occurred about 250 million years ago. This extinction event was far worse than the one which nearly wiped out the dinosaurs, and it appears that life on Earth was nearly completely wiped out. It was this event which made way for the evolution of the dinosaurs. If there were dinosaur paleontologists they would have viewed this group in much the same way we view the dinosaurs. The K-T which most people are more familiar with also took a toll on the order and the genus Sphenodon was the only one to survive. Tuataras have unusual morphology to match their unusual phylogenetic position. They have two upper rows of teeth and a lower row which fits perfectly in between them. They have separate retinas for night and day vision, three eyelids on each eye and can focus their eyes separately. Young Tuataras have a third eye called a parietal eye on the top of their head which disappears as they get older. It is not a fully developed eye but it is definitely an eye. We're not quite sure what it's for, but it does have a nervous connection to the brain. The juveniles are diurnal but the adults become nocturnal. Their scales are like crocodiles, their primitive ears are like turtles and they can detach and regrow their tail like some lizards. They reach maturity at about 20 years old, stop growing at 30 years and their maximum life expectancy is unknown but we expect that they can live up to 100 years. 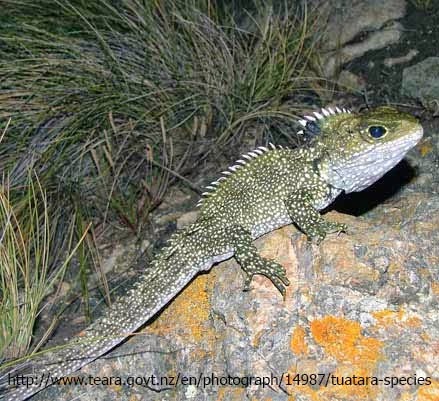 Tuataras have no external reproductive organs but their cloaca secretes all kinds of interesting chemicals including an otherwise unknown acid called Tuataric acid. We're not sure what all these chemical do, but it is suspected that they are used to recognize one another. They are very territorial animals and will savagely attack intruders. They also have hourglass shaped vertebrae which is common in fish and amphibians and a set of gastric ribs which is present in Crocodiles and some lizards They can grow up to 80 cm long and generally eat birds eggs, large insects, and small vertebrates like amphibians and lizards. New Zealands only native mammals are bats and the introduction of small mammals, especially rats, has taken a toll on their populations. Tuataras are endemic to New Zealand and have a rather restricted distribution surviving only on the outlying islands of the archipelago. There are two living species of Tuatara, S. punctatus and S. guntheri. 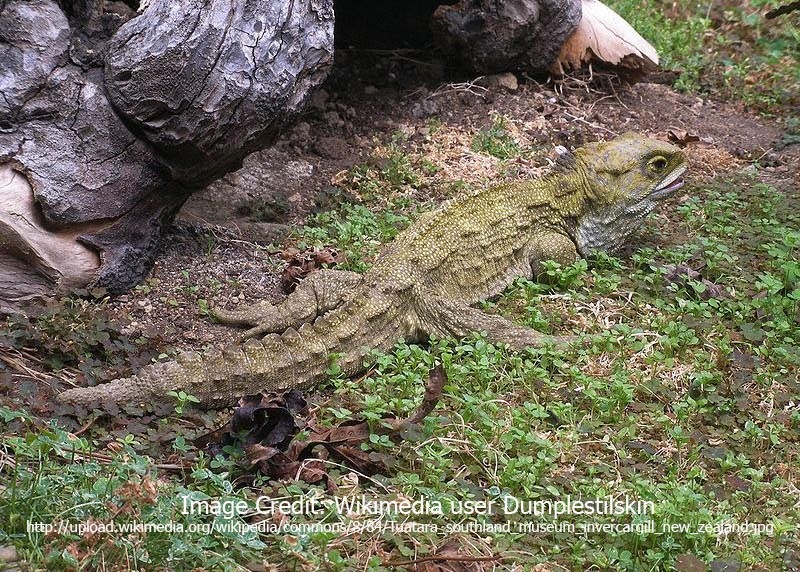 The closest living relative of the Sphenodon are the Squamata, a group which includes all snakes and lizards. Despite superficial appearance they are temporally quite distant from the Squamata. Many classifications will list them as Class: Reptilia, Order: Rhynchocephalia but I will stick with the classification which uses natural groups.